When starting out in astrophotography you will hear all sorts of advice on how to get the best out of your images. Terms such as Flat Fielding, BIAS and Dark Frames are frequently offered. This bewildering barrage of advice and complication of process gives the impression of astrophotography as a black art, not to be attempted by mere mortals due to its complexity. These techniques do help improve your astronomy photographs when you are more advanced, but when starting out there really is no need to go to those sorts of lengths. Taking pleasing images of the night sky doesn’t have to be as complicated as it sounds and you certainly don’t need to do anything technically challenging or use any specialist equipment to produce good astronomy images for yourself. Great images can be taken using the simplest of photographic equipment as long as you take care in getting yourself set up correctly and making the most of your equipment. The best advice to give to the aspiring astrophotographer is to keep things as simple as possible for a while and learn the basic techniques first. Any camera that is capable of taking an exposure of more than a few seconds exposure is capable of taking images of the night sky. Even some small compact cameras sometimes have a Program or light Landscape mode. This automatically sets a long exposure of a few seconds and focuses the lens at infinity. Some nice constellation images can be taken this way. 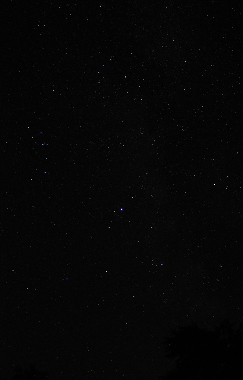 Figure 1 was taken using such a camera using Night Landscape Mode and shows Taurus quite nicely and the star colours of Aldebaran, Betelgeuse and the Pleiades Star cluster. Figure 1. Winter constellations taken with a pocket camera. (The red artifacts on the left hand side of the image are street lights reflecting of our pergola). A DSLR has much more flexibility in what you can achieve, so really is the preferred option if you can afford one. There is a lot of dispute on the Internet regarding the different makes of DSLR that are ideal for taking astronomical images. Most people seem to regard the Canon range as being the best, with lots of talk of the Nikon stripping out data when it takes an image (the dreaded Star-Eater). If you have a Nikon or other make of camera, excellent images can still be taken regardless of the make. Most of my images have been taken with Nikon cameras, and have never seen any issues. Therefore use whichever camera you have at your disposal. There is no necessity to change camera if you already have one to hand. One thing I need to mention is that there is a lot of third party software available for use with cameras in the Canon range, so if you are considering buying your first camera for astrophotography, I would recommend a Canon for this reason only. However adding software and computers into the process of taking images adds much to the complexity of taking your images and is another thing to getting to grips with and go wrong. So I feel that this is best avoided when you are first starting out. There are a couple of settings that should be set from the beginning if you are taking astrophotos. These are normally available from within the camera’s built-in Menu. a. After you have taken each image, the camera will take a second exposure with the same settings but with the shutter closed to produce a dark frame of the same exposure to process your image to reduce noise. It will therefore take twice as long to take your images. b. The noise reduction process will degrade the data contained within your image. 2. Make sure that the images in the cameras RAW file format. (I tend to save my images as both hi resolution JPG and RAW, you will see why later). Set the ISO to at least 400, preferably more (800-1000). The higher the number of the ISO setting, the brighter the resulting image and the fainter the object you will record in less time. A disadvantage of this is that you will also get more noise in your image. The lower the number of the ISO setting, the darker your image will be for a set exposure. A benefit is that you tend to get less noise in your image. But you will need a longer exposure to reveal fainter objects. The lens you use will determine what you capture. A wide angle lens ~20mm will show a bigger expanse of sky (i.e. a wide field of view). A 100mm lens will show a much smaller field of view. A variable focal length lens will enable you to frame different constellations better, but the quality and f-ratio is normally less. A lens with a bigger F-number will produce a fainter image, and will need a longer exposure to show faint objects. So it is best to use a lens with as small an F-number as possible. This is normally known as a “fast” lens. Holding the camera absolutely still is essential. You need something that will hold the camera steady for the extent of the exposure. Although tripods are best, you don’t necessarily need a full sized tripod. A Gorilla Pod, or something like it, can also be used. A mount like this is light and portable and will enable you to mount the camera on any convenient sturdy support. I have managed to take some nice Milky Way shots with my DSLR on holiday this way: The camera being supported on the back of a Sun lounger. As long as it is sturdy enough to resist movement when the shutter is released, and hold it still throughout the exposure it will be good enough. Figure 2. Camera mounted on a sturdy tripod. A means of making long and multiple exposures. a. When you press the button the camera will shake before settling down. b. Constantly having to press the shutter at the beginning of every exposure can become somewhat tedious after a few hours. The best way to get around both of these problems is to obtain an accessory which can be used to take multiple exposures. These can be as simple as an infra-red release which will open the shutter when first pressed, and close the shutter when subsequently pressed. An Intervalometer can be purchased for less than £20 and will enable you to program the camera to take a number of images one after another. This method of taking images is almost essential unless you want to stand there and keep releasing the shutter manually. Figure 3. An Intervalometer attached to the authors Nikon. Once you have got your camera all set up securely mounted and ready to go. Make sure that you are very familiar with the camera and lens so that you can operate it expertly in the dark without too much fumbling around. Pick an area of sky that you are interested in, such as a familiar constellation or a bright patch of Milky Way. Point your camera towards your chosen area of sky. If you have a variable focal length lens adjust the zoom on the lens to frame your chosen area of sky accordingly. The shorter the focal length of lens used, the brighter the image, the wider the field of view you will have and the less star trailing will show up in your final image. The longer the focal length lens, the fainter the image will be and the narrower the field of view. Star trailing will show up much quicker. Set your camera lens to infinity then take an exposure of about 20 seconds. You may find when you look at your resulting image, that the stars are more than pinpricks. Zoom right in to see what the star images look like. Chances are that even if you set your lens to infinity (which is where the stars are) your lens may still not be properly in focus. You may need to experiment a few times and keep adjusting the focus in order to get really pin sharp stars. Figure 4. Where is the real Infinity focus position on your lens? Once proper focus has been achieved, I find it best to apply a short piece of black insulation tape to the focus ring to prevent it moving. Live view cameras can really assist in getting focus quicker. Reducing the aperture will help in focussing the lens, but then the image will be fainter and you will need a longer exposure. Once you are happy that the camera is in focus, you should be ready to take your first exposures. Take a number of exposures of the same object and vary your exposure in each one. Start with a 10 second exposure and take subsequent images increasing each exposure by 10 seconds up to a 1 minute exposure. Inspect each image and note at which exposure you can just start to see star trailing showing up in your image. The best exposure to use will be the one just before star trailing becomes visible with that focal length lens and camera combination. (As a rough guide if you use a 20mm lens you can get away with about 45 seconds exposure before the star trailing as a result of the Earth’s rotation starts to show). Once you have found this exposure time, set the timer and take a number of identical exposures at that same setting, pointing at the same chosen point in the sky. Take up to 20 exposures. You will have now captured everything you need for a good astronomy photo. Without touching the lens focus or zoom, move the camera to a different point in the sky and take a number of images in exactly the same way. If you do need to change the focal length of the lens, you will need to check your focus and exposure time once more as described previously before continuing. At the end of your imaging session you will have captured quite a number of images. Each of your final images will have a series of separate images (Subs) that will be processed together to produce your final image. Processing Your Hard earned images. Now comes the fun part in processing the data you have captured so it gives you a great picture. As its name suggests, this is a very nice piece of free software that enables you to add images together to produce star trail pictures. 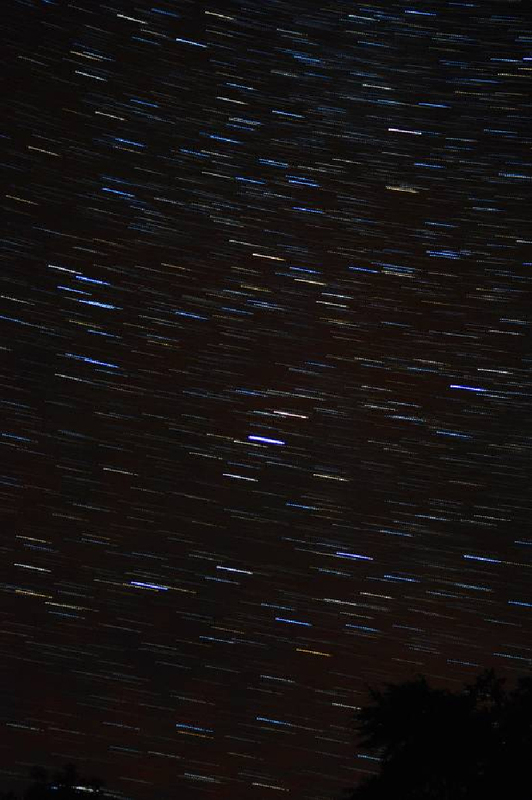 If your camera is static on a tripod (as yours is) the stars are moving across the sky due to the Earth’s rotation. This means that between each of your exposures, the sky will have moved a short distance across the camera chip (also slightly rotated). If you take enough images and put them into Startrails it will show the difference in the stars position and you will see the movement quite easily. The use of JPG’s that I suggested earlier would be better for this as they are smaller images and are easily handled by Startrails software. 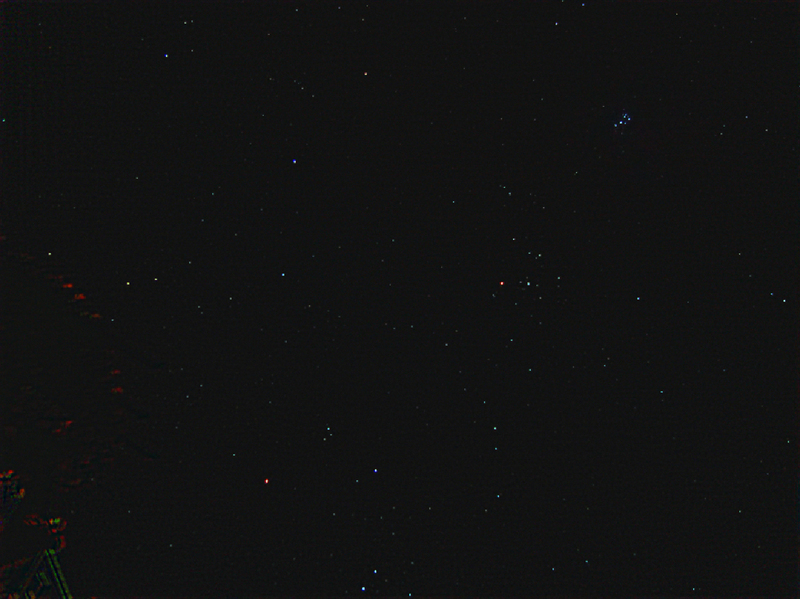 To show you how it works, Figure 5 is a 20 second image of Aquila taken with my DSLR from a dark sky site in Wales. It doesn’t really look very exciting, does it? Figure 5. A single 20 second Sub of the Milky Way in Aquila. But because a number of similar images were taken (I took 17 images exactly the same) once they are processed using Startrails, something a little bit more exciting starts to reveal itself. Figure 6 shows the result. Figure 6. 17x 20 second subs of the Aquila Milky Way processed in Startrails. Startrails enables you to see the movement of the stars and produce star trails using the images you have already taken. This techniques also makes the colours of the stars show up very nicely. As well as a producing an image showing star trails, this software can also produce an animation of the stars movement and export it as an AVI file. Also a free piece software, DSS enables you to stack your images together. This will add the data from each sub together and lift fainter objects out of your images. Using the very same 17 images RAW images of Aquila shown above I processed them using DSS. Unlike Startrails, DSS looks at the images and determines where the stars are located on your image. When it processes the images, despite the fact that the stars have moved between exposures, it will register the stars on top of one another and stack them correctly adding the data from all the images together. As a result of this, faint objects you can hardly see on the original images are made much brighter and stand out much clearer. Figure 7 shows the result of stacking the 17 RAW images of Aquila together. An adjustment of the levels in a graphics editing program may be required to bring out the detail. Figure 7. 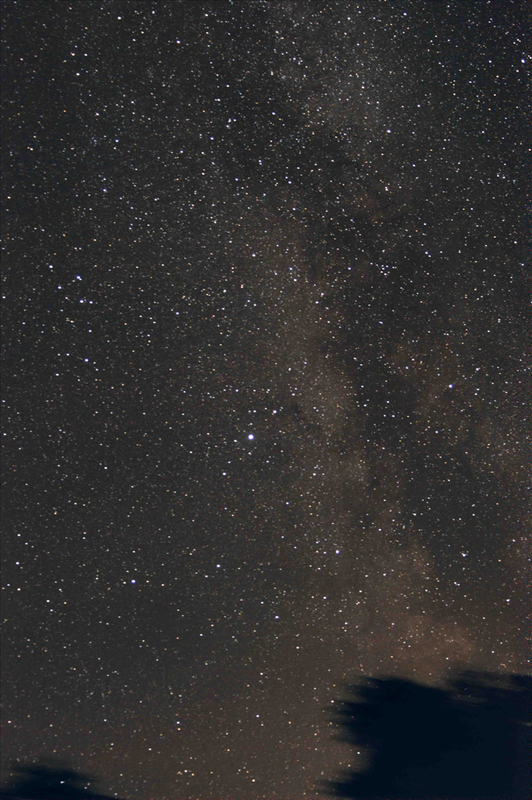 17x 20 second subs of the Aquila Milky Way processed using Deep Sky Stacker. Now the bright band of the Milky Way and the dark rift at the side of Aquila are easily revealed. I’m sure you will agree that this is not a bad result for a camera standing static on a tripod and is a great way of taking some deeper wide field night sky images without great expense and having to track the sky. Figure 8. A montage of the Milky Way from the Maldives taken untracked using the procedure outlined above. Go on, give it a go. You really won’t be disappointed.